The years 1865 to 1867 were by far the most intense of the conflict, though intermittent conflict occurred until federal troops intervened in 1872. The Utah Territory spent $1.5 million dollars on the war (equivalent to $26.58 million in 2017), and later requested reimbursement from the United States Government. ↑ The Black Hawk War in Utah, by Phillip B. Gottfredson Archived April 6, 2007, at the Wayback Machine. ↑ 41st Congress, House of Representatives. Mis. Do. 1st Session. No. 10. Memorial of the Legislative Assembly of Utah Territory, For an appropriation to pay for Indian depredations and expenses incurred in suppressing Indian hostilities. ↑ "Utah History of the Black Hawk War". Official Web Site for the State of Utah. http://historytogo.utah.gov/utah_chapters/american_indians/blackhawkwar.html. Retrieved March 20, 2008. Originally from: John A. Peterson (1994). "Black Hawk War". Utah History Encyclopedia. University of Utah Press. http://www.uen.org/utah_history_encyclopedia/b/BLACK_HAWK_WAR.html. Retrieved 2015-08-31. ↑ Martin, James R.. "How can you buy or sell the earth?". Management and Accounting Web. http://maaw.info/ChiefSealthsReply.htm. Retrieved December 28, 2012. ↑ Sanpete County Commissioners (1982). "Indian Encounters". In Antrei, Albert C.T.. The Other Forty-Niners: A topical history of Sanpete County Utah 1849–1983. Ruth D. Scow. Salt Lake City, Utah: Western Epics. pp. 127–148. ISBN 0-914740-26-1. ↑ Lowry, Walker (1974). Wallace Lowry (1st ed.). Lunenburg, Vermont: Stinehour Press. p. 51. ↑ 7.0 7.1 Gottfredson, Peter (30 September 2002) . Indian Depredations in Utah. Fenestra Books. pp. 323–335. ISBN 1587361272. ↑ Mciff, Rose (1970). "Weep Not for Me Mother". Saga of the Sanpitch. 2. Snow College & University of Utah: Sanpete Historical Writing Committee. p. 18. http://sanpete.com/downloads/saga/Saga_of_the_Sanpitch_2.pdf. ↑ STATEMENT, M. S. MARTENAS, INTERPRETER Great Salt Lake City, July 6, 1853 Brigham Young Papers, MS 1234, Box 58, Folder 14 LDS Archives - Will Bagley Transcription. ↑ Olsen, John K. (1979). "What did Walker Want?". Saga of the Sanpitch. 11. 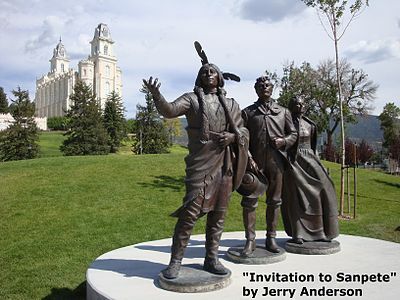 Snow College & University of Utah: Sanpete Historical Writing Committee. p. 17. http://sanpete.com/downloads/saga/Saga_of_the_Sanpitch_11.pdf. ↑ Sonne, Conway Ballantyne (1962). World of Walkara. San Antonio, Texas: Naylor Co.. pp. 161–205. ↑ Phillip B. Gottfredson. "Facts Concerning the Utah Black Hawk War". lack Hawk War Productions. http://www.blackhawkproductions.com/facts.htm#HIEF_SANPITCH_. Retrieved 2013-08-17. Sanpete County Commissioners (1982). Antrei, Albert C.T. ; Scow, Ruth D.. eds. The Other Forty-Niners: A topical history of Sanpete County Utah 1849–1983. Salt Lake City, Utah: Western Epics. ISBN 0-914740-26-1.